Deputy Chief Rich Elliott. . .
has been in the Fire Service for years. He began his career as a fire/medic with Clayton County Fire & Emergency Services in Jan. 2001. He has advanced up the career ladder, and in Mar. 2014 was promoted to the rank of Deputy Chief of Planning & Training. He is certified as a State of Georgia Firefighter and licensed as a Paramedic and Level III Paramedic Instructor. He holds NPQ certifications as a Firefighter I & II, Instructor I & II, Fire Officer I & II, and HazMat Technician. He also holds instructor certifications with P.O.S.T. and with the American Heart Association in BCLS and ACLS. 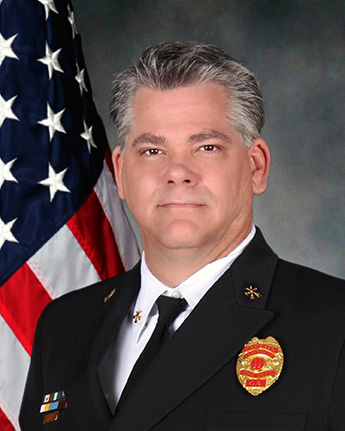 Chief Elliott is a member of the Metro Atlanta Fire Chief Association, Georgia Department of Public Health Region III Council, and the Georgia EMT Association. The Planning and Training Division is charged with the development, delivery, and facilitation of training programs for new and veteran members of our department covering areas of fire suppression, hazardous material mitigation, rescue specialist certification, emergency medical services, career and officer development. These programs ultimately result in professional and competent fire and emergency services for the citizens and visitors of Clayton County, Ga.